"Seeking God is our last one shot"
When I met Edwin for the first time, he was at the Eben Ezer church at the time of the worship. Edwin was praying, closed eyes turned to the sky, with his hands pleading to be heard. His shirt collar was tighter adjusted. But, at each head movement turned to the sky, part of the “Eighteen” tattooed around his neck appeared. Through the name of his former gang, it was like if his past belonging to the gang was bellowing to claim him and trying to dominate him. It was one of the expression of an internal struggle. And I asked me how this radical change could be possible, what were the mechanisms, both personal and social, that allowed him to break with a fatal destiny dedicated to criminality. 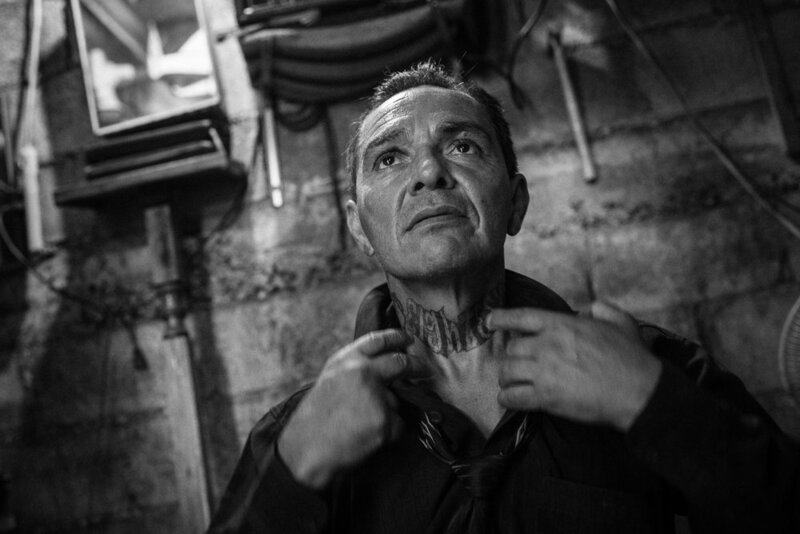 For more than 20 years, the country of El Salvador faces an endemic violence related to gang activity. There are between 10,000 and 70,000 active members in a country of just 7 million people. While a new Assembly was elected in 2018, the political class, all political parties combined, has so far only promoted measures increasingly repressive, without removing the gangs. As a result, the prisons have filled up, exploding their capacity of reception, while the public programs of rehabilitation are almost non-existent. Only some evangelical churches welcome those seeking to break with their past lives, even if their action is not always well accepted by the public forces and the rulers. Conversions to Evangelical Protestantism are usually done in prison. One of them, located in San Francisco de Gotera, in the north-east of the country, reveals the extent of the phenomenon: the 1,500 prisoners sentenced for their activities in the gang Barrio 18, are now all fervent Christians evangelizers. Wilfredo was one of these pastors. And most of the former gang members at the Eben Ezer church came from this jail. Others like Edwin experienced a revelation, an “encounter with God under the shadow of terror” that caused him to dedicate his life to preaching. Now, they spend their daily life between the religious worship, odd jobs or helping to convert other gang members. They are seeking to have a “normal” life, despite the stigmata of their past occupation and the physical evidence of that life in the form of tattoos, on the face and body, make their past visible at any public gathering. Conversions are based on true faith: their only opportunity is this "encounter with Jesus," which leads them to repentance, the possibility of receiving forgiveness with a rebirth to consecrate their lives to Jesus. It is also the possibility of finding an inner peace, as a way out to their inner liberation while accepting the conditions of their material existence.